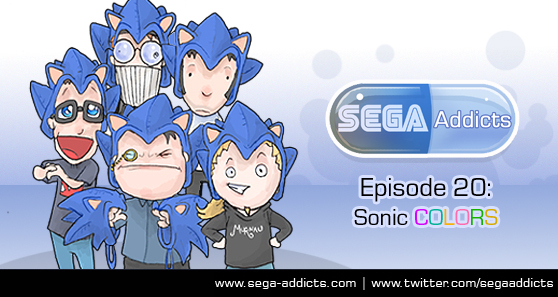 For our 20th episode the Sega Addicts were joined by none other than Sega’s Keith Dwyer, producer of the Wii & DS versions of Sonic Colors. The entire episode is devoted to the upcoming Sonic games and for two hours we try and pry out as much information as we can from Mr. Dwyer. He’s a clever guy though and he did successfully avoid answering a few of our questions. From what we did find out Sonic Colors is sounding like its going to be a great game and that release date couldn’t come soon enough. David Hayter should voice Shadow, if only to complete the joke that Shadow is the Sonicverse’s Snake. I kind of wonder if there will ever be a 3D Sonic game made without Sonic or any of his friends talking. I just imagine that if the cutscenes and stories were told entirely through the visuals and actions if would be much stronger. A good example is many of Pixar’s shorts which rarely have any spoken dialogue. Alex, does “The Maw” count as another example? “The Maw” has one spoken word. Most everything is done through the character expressions or explained with thought bubbles. I’ve never played the game but it sounds like that’s exactly what I’m talking about. I’m totally with you on this one, Alex! That would give the game much more subtle and creative expressiveness–instead of just characters blabbing all the time! I think cut scenes like that were particularly cool in Sonic CD–nobody said a word, but it got the story across perfectly. Also Pixar is the shiz-nit. Do people still say “shiz-nit”? Well, they should!